Welcome to the web site of St. George Orthodox Church in Trumbull, Connecticut! We are a parish of the Albanian Archdiocese of the Orthodox Church in America. We invite you to explore our web site to learn more about us and about Orthodox Christianity. 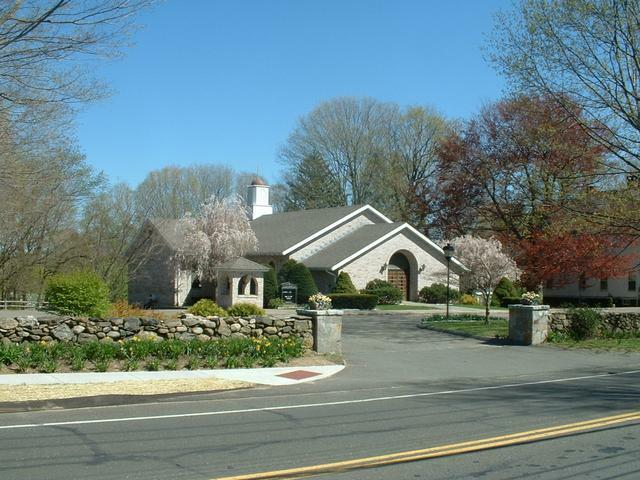 Located just north of the Merritt Parkway in Trumbull, we are easily accessible from both Fairfield and New Haven Counties. We welcome all visitors for worship and fellowship! Many thanks go out to all that donated items for the Easter baskets for the residents of the Homes of the Brave. A special meal is being prepared for them on Easter Sunday by Trumbull Helps who will also distribute the baskets. Thank you for making their holiday extra special! Many thanks for supporting the “Pajama Collection for Children in Poverty.” The program has been very important to the Orthodox Women's Council. Thank you for helping make it a success! Many thanks to Laura Chadwick who published the Weekly Bulletin the past 7 months. Additionally, we wish to thank Kim O’Brien who has volunteered to take over the preparation of the weekly bulletin going forward - we appreciate her stewardship in taking on this role. Our sincere thanks go to Laura Chadwick who has left the Parish Council after serving her term. At the semi-annual Parish Meeting, which was held on February 10th, Laura Coughlin was elected to join the Council for a new 3-year term. Laura joins the current Council members Joe Chadwick, Luba Csernica, Peter Dacey, Joseph Galich, Louise Gallagher, Cathy Hotova, Bill Kovachi. and Bob Lazar. Many Years! Për Shumë Vjet! The parish of St. George was saddened to learn that Christy Lambert passed away on Friday, February 8th. We offer our condolences to Katherine, Nancy, and Thomas and their families. Memory eternal! We welcome back Father Sergei Bouteneff who will fill in for us for the next three months with Archbishop Nikon’s blessing. We extend our sympathy to Peter Dacey and his family at the loss of their uncle, Peter Costulas. May Peter’s memory be eternal! We extend our sympathy to Elsie Gartsu and family on the loss of her sister, Paula Cane. May Paula’s memory be eternal! The parish of St. George extends a heartfelt welcome to Father John Mikitish who will be serving Divine Liturgy for the month of January. The parish of St. George extends a heartfelt welcome to Fr John Jillions and the parishioners of Holy Ghost Church. Fr. Jillions gratitiously volunteered to co-celebrate Divine Liturgy on The Feast of Theophany at St. George for both parishes. On Satuirday, Vespers for the Eve of Theophany were hosted and co-celebrated at Holy Ghost Church in Bridgeport.